What follows concentrates upon the Hofkapelle or court orchestra who were the most significant musical group at court. Augustus the Strong's conversion and election to the throne of Poland had important consequences for the Hofkapelle. Court musical activities were greatly expanded to cover functions in Dresden and Warsaw. As Warsaw was only a "part time capital", Augustus only spent a few months each summer there the main orchestra was based in Dresden. The conversion of the former opera theatre to a Catholic Court Church in 1708 meant that a new repertoire of Catholic church music was required. From 1694, whether because of Augustus the Strong's influence or that of his Kapellmeister Johann Christoph Schmidt (who had recently visited Italy) a new contractual condition came into effect that meant that instrumentalists of the Hofkapelle were responsible for performing exclusively on one instrument. This specialisation was almost unique to the Hofkapelle among court orchestras for many years and did not apply to other instrumental ensembles at court. This must have considerably increased the virtuosity of it's musicians, particularly compared to the typical Stadtpfeiferen (Town Musician) of the day. The only exception to this being the provision of occasionally used instruments, notably the viola d'amore, oboe d'amore and chalumeau. The same specialisation even applied to copyists that by 1755 numbered five. "Thus in March 1716 I went to Dresden. … The Royal Orchestra at that time was already in a particularly flourishing state. Through the French equal style of execution introduced by Volumier, the concertmaster at that time, it already distinguished itself from many other orchestras; and later, under the direction of the following concertmaster, Mr. Pisendel, it achieved, through the introduction of a mixed style, such refinement of performance that, in all my later travels, I heard none better." While the Crown Prince was on the Grand Tour he gained his most significant impressions in Italy. He had been specifically instructed by his father, Augustus the Strong to recruit singers for the Dresden opera and church. In 1717, he secured the services of the composer's Johann David Heinichen, Francesco Maria Veracini and Antonio Lotti (complete with opera company) whilst in that Venice. At his instigation the size of the Hofkapelle was again increased to include 33 instrumentalists without counting the Kapellmeisters, composers or trumpeters. The violas were no longer divided, the violincelli and double basses generally performed in octaves and oboes and bassoons were increasingly used to augment the string tuttis. Consequently performance of music, particularly opera in the Italian style that he favoured was possible. This and the practise of musicians accompanying the royal family on their trips abroad (several chamber musicians accompanied the Crown Prince to Italy 1716/17, Vienna 1718 and Paris 1724) served the dual purpose of providing them with music they enjoyed and an important musical education for the musicians that accompanied them but was responsible for an artistic "split" within the Hofkapelle between the two elements of musical influence i.e. The French goüt as advocated by Jean Baptiste Woulmyer, Johann Christoph Schmidt and Christian Petzold and the Italian gusto advocated by Johann Georg Pisendel and his friend the oboist Johann Christian Richter. 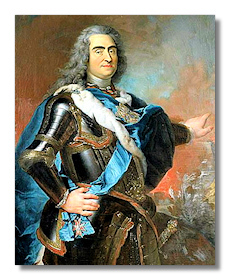 The Crown Prince was well aware of the antagonism to be expected between the established musicians at court and the 'new' imported musicians both financially and stylistically and this may explain why he took Veracini into his private service before he was transferred to the Dresden payroll as violinist in August 1717. Indeed a letter to Count Watzdorff in Dresden proves the Crown Princes concerns were not without justification. I have already remarked to you with perfect confidence how much I have it in my heart that the musicians engaged for the service of the King be treated according to the terms of their contract (s). It has since come to my attention that Schmidt has quarrelled with Heinichen concerning a concert of his production, and as I understand that the same (thing) can happen to the (other) musicians who are, the same as he, under my protection, and whom I have strongly recommended to you, I ask you, Monsieur, to prevent similar quarrels by your authority, and to prevent such (quarrels) which Schmidt and Volumeir might try to initiate against Signori Lotti and Veracini upon their arrival in Dresden, so that each of them (Lotti and Veracini) is satisfied with his arrangements, for which I shall be truly obliged (to you)…." So commenced a shift in emphasis that was only finally concluded on the accession of the Crown Prince. By 1733 and the accession of Friedrich August II the orchestra numbered 42 and by the outbreak of the Seven Years War in 1756 the Kapelle had reached a total of 48, excluding Kapellmeisters, composers and the Hoftrompeters. Indeed the use of musicians from other ensembles at court for special occasions meant that the Grosse Hofkapelle was not rivalled in size until the last years of the 18th century. Clearly quality was not sacrificed for quantity according to both primary and secondary sources. Concerning the nationalities of the musicians employed clearly native musicians predominated (if Bohemians, Poles and Austrians are included in this category) and that the shift in emphasis from the French style to that of Italy is mirrored in the numbers of French and Italian musicians. With respect to Kapellmeisters, composers and chamber musicians this predominance in native musicians is also apparent. This is not altogether surprising when one considers the number of renowned musicians born in Saxony and neighbouring Thuringia was prodigious. Among the most well known are J.S. Bach, Demantius, Froberger, Fasch, the Graun brothers, Graupner, Handel, Hebenstreit, Heinichen, Keiser, Reiche, Schneibe and Zachow.